With a strong core and a number of returning veterans, Portland looks to prove their 2014 success was no fluke. 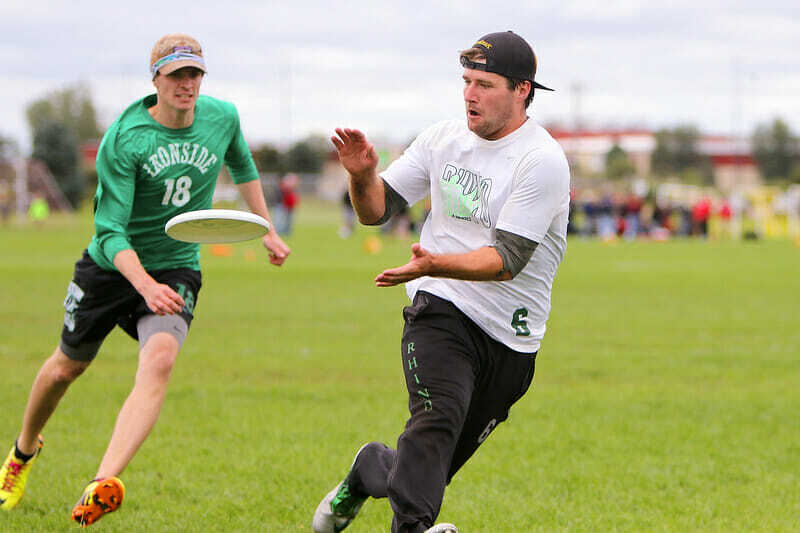 After missing out on club nationals in 2013 then coming back to finish 6th in 2014 with one of the biggest wins in recent history, it’s safe to say Portland Rhino wasn’t planning on coming into the 2015 club season under the radar. In their second to last win in Frisco last October, Rhino knocked Seattle Sockeye out of prequarters on double game point. This was only Rhino’s third win over Sockeye in the past ten years and they couldn’t have chosen a better stage. Portland went on to secure their spot in the Pro Flight and Sockeye was left out for the first time since the start of the Triple Crown Tour. However, while that win is what everyone was talking about heading into the 2015 season, it’s not what Portland is focused on. Rhino looks to improve overall as a team this year and not to focus on specific wins. After skipping the U.S. Open in July, Rhino stepped on to the 2015 club scene for the first time at the Pro Elite Challenge in Colorado in early August. Their roster has seen some turnover since its release in early June and—despite some unfortunate losses—is looking as strong as ever. With the exception of two rookies, all of these athletes have previously played together on the club, college, or pro level—some have all three. Fifteen of them are coming off a 9-1 MLU season with the Portland Stags, missing out on the Championship by a single point. Five are fresh off an Oregon Ego second place finish at College Championships, their best in over five years. The rest return from either playing elsewhere or taking a break and come back refreshed and ready for what could be one of Rhino’s most competitive years in recent history. This core has seen little turnover in the last few years and is only strengthened by the returning veterans. With Jacob Janin and Dylan Freechild holding the reigns for a second year in a row, it is an Ego Alum heavy crew with the usual Portland staples in the mix. Veterens Chase Sparling-Beckley and Matt Melius1 are back from three-year hiatus and Bryson Uhrig-Fox is back after a few years with Seattle Voodoo. Eli—the elder of the Janin’s—returns as well after spending some time in the Bay Area playing with the AUDL’s San Francisco FlameThrowers. The roster will also see the return of veteran players Breeze Strout and Dusty Becker, as well as handler Jeremy Norden. Defensive anchors Topher Davis, Riley Meinershagen, and Brian Penner return to the Rhino roster after spending the spring with the Stags along with Cody Bjorklund, Dan Suppnick, and Ben McGinn on the D-line. Rhino’s defense is happy to have Davis and Penner back after the two spent a quiet 2014 club season with Eugene Dark Star. Meinershagen, on the other hand, made a more dramatic switch to Seattle Sockeye last season and his Portland teammates are glad to have the defensive ringer back on their side for 2015. Rhino’s defense also returns favorite handler defenders Grant Cole and Chris Strub. Ego captains Freechild and Trevor Smith will hold down the offense along with Ego alums Tyler Cable, Eli Janin, and Eli Friedman. MLU Offensive Player of the Year Timmy Perston will rejoin the O-line with explosive Ego cutter Connor Matthews and Rhino rookie, Lewis & Clark captain Ben Whitenack. Whitenack had a breakout performance during his first tournament with Rhino in Colorado. With nearly unmatchable speed, he’ll be one to look out for this postseason. While the changes to the core of the team are minimal, there are some notable names missing from the Rhino roster this season. Starting cutter and Oregon alum Camden Allison-Hall went down with an ACL tear at the start of the Stags season and will be out for the whole of the 2015 club year. Handler Chris Hancock suffered one of the most intense injuries the sport has seen during a Stags game in May and went out with a dislocated hip and fractured pelvis. Both athletes have had surgery and are well on their way to full recovery. Since the Rhino roster release in June, the team has had to replace returners Peter Woodside and Kelly Van Arsdale. Woodside, after having incredible year with the Stags and taking home both Defensive and Breakout Player of the Year titles, fractured his left arm and his right wrist during the Western Conference Final and will be out for the season. Another notable departure from the list is Lewis and Clark alum and four year Rhino vetern Ben Lohre who returned home to Colorado and has joined the 2015 Johnny Bravo roster. Despite having some holes in the roster, Rhino gave a strong showing on day one of the Pro-Elite Challenge, beating San Francisco Boost FC and D.C. Truck Stop in pool play and losing only to Doublewide before taking out Temper in Prequarters. Day two started out with a solid performance against Sockeye—Rhino losing 13-10—before dropping the last two games of the day to Machine and High Five. Seeded 4th going into the day, they finished in 8th. That they should. This is a tight knit group of athletes with full faith in their team and their teammates. Spend even just a day with this team, it’s hard not to feel their spirit. They’re determined, they’re focused, and they’re super proud of what’s being built in Portland. Addison Magness is a Portland-based Ultiworld reporter. This year, she worked as the content manager and lead writer for Major League Ultimate's Portland Stags. Comments on "Picking Up Where They Left Off: Rhino 2015 Club Preview"